As has become tradition at the start of each year, the FC Barcelona first team held on open door training session at the Miniestadi where fans of the club were able to see their favourite players up close. The children were, as ever, the real stars of the show on a festive day which saw 10,408 fans turn up to watch Luis Enrique’s men in action. The session began with the players entering the field to the Barça hymn as fans waved the club flags, creating a fine atmosphere inside the stadium. After a few laps of the pitch, the session was divided into various sections around the field so fans could witness several exercises. Typically, the front three of Leo Messi, Luis Suárez and Neymar Jr brought the loudest cheers while there were also chants for Ter Stegen, Piqué and Iniesta among many others. The fans thoroughly enjoyed the event as they cheered and sang non-stop throughout, as well as celebrating each goal and applauding magical moments of individual skill. Once the session was over, the players launched dozens of balls into the grandstand, providing a lucky few with priceless souvenirs. But that show of generosity on behalf of the players was quickly superseded by a series of far more selfless and magnanimous gestures, as the players approached the fans located in the lowest rows of the seating area to sign autographs and take selfies. The emotional aspect of this open-hearted gesture hit a crescendo when the footballers turned to the section reserved for children with disabilities, who were seated in their wheelchairs at the edge of the playing surface. A beautiful mélange of wide smiles and tears of happiness were splayed across the faces of those who got to meet their idols. It was perhaps the greatest holiday gift many of them have ever received. 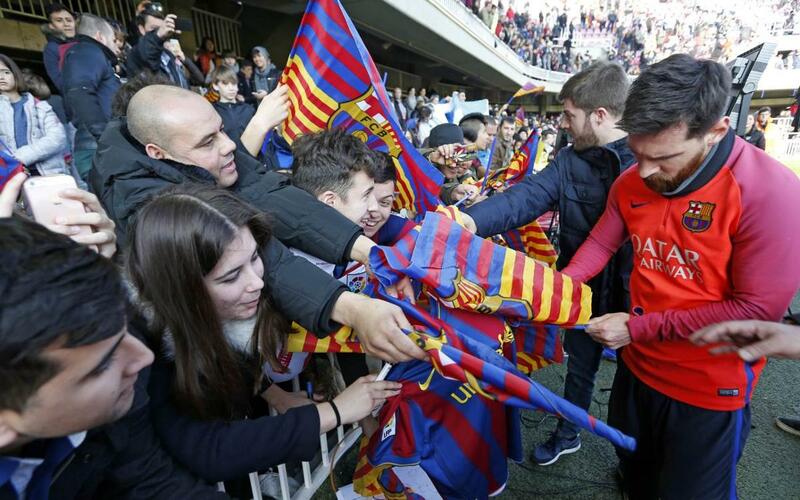 The Barça players were delighted with the unique atmosphere at the Miniestadi Tuesday morning. “It’s a great way to have the fans up close,” pointed out goalkeeper JordiMasip. The Argentinian also took the chance to speak about Barça’s coming Copa del Rey tie with Athletic Club.